Home2 Suites by Hilton Baton Rouge features an outdoor pool and a 24-hour fitness center. Wireless Internet access is complimentary. This hotel offers access to a 24-hour business center. Guests can enjoy a complimentary breakfast each morning. This business-friendly hotel also offers barbecue grills, a picnic area, and laundry facilities. Onsite self parking is complimentary. A total renovation of this property was completed in 2017. 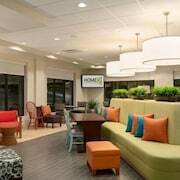 Home2 Suites by Hilton Baton Rouge is a smoke-free property. 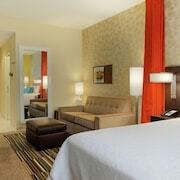 Situated in Baton Rouge, this hotel is 1.2 mi (2 km) from Rockstar Racing and 2.9 mi (4.6 km) from Mall of Louisiana. Blue Bayou Waterpark and Gateway 12 Shopping Center are also within 6 mi (10 km). Along with an outdoor pool, this smoke-free hotel has a 24-hour fitness center and a 24-hour business center. Free buffet breakfast, free WiFi in public areas, and free self parking are also provided. Additionally, dry cleaning, laundry facilities, and a 24-hour front desk are onsite. All 94 rooms have LCD TVs with cable channels and feature kitchens with refrigerators, microwaves, and dishwashers. Guests will also find free WiFi, MP3 docks, and sofa beds. Home2 Suites by Hilton Baton Rouge offers 94 air-conditioned accommodations with MP3 docking stations and coffee/tea makers. Accommodations have separate sitting areas and are furnished with queen sofa beds. 42-inch LCD televisions come with premium cable channels. Kitchens offer full-sized refrigerators/freezers, microwaves, cookware/dishes/utensils, and dishwashers. Bathrooms include complimentary toiletries and hair dryers. Guests can surf the web using the complimentary wireless Internet access. Business-friendly amenities include desks, complimentary weekday newspapers, and phones. Housekeeping is offered daily and hypo-allergenic bedding can be requested.